With Thanksgiving mere days away, I was almost a little sad to see that my verse this week was not from Psalms and did not explicitly mention giving thanks. However, when I looked up Isaiah 26 in its entirety, I found it is actually titled “A Song of Praise.” That should work! 😉 And, really, anything would have worked because I should be (and am) thankful for all of Scripture. I am also thankful for the connections the Holy Spirit puts together in the minds of believers. I’m experiencing this today, as I see ideas from last week’s passage (Psalm 100:1-3) plugging in to this week’s passage. As I read a bit of Isaiah 26 I also found connections to my Revelation study through BSF International, AND, some connections to a talk I heard in October at the Middle School Ministry Campference, delivered by the one-in-a-million Heather Flies. Oh, and Psalm 100 was featured prominently at church yesterday through congregational reading AND in the sermon. Wow! I’d better lay this all out and solidify it before I forget. So. Last week in Psalm 100 I read that we are God’s people, the sheep of his pasture. I learned at church yesterday that this wording shows God’s care and provision for us. This plugs into Isaiah 26:3 nicely– he keeps us in perfect peace, just as a shepherd does for his sheep. This is where I think of the talk I heard at the Campference. We learned that shepherds would create makeshift pens for their sheep to rest in when the herd got to a stopping place of the shepherd’s choosing. The talk was about waiting well, and my takeaway was: when God (my shepherd) causes me to wait, do I trust that he has me in a good place and rest peacefully trusting him? Can I be satisfied to only move on when he opens the gate? OR, do I fitfully press myself up against the wall of that pen because I’m so focused on what I want to happen next? Even when it seems like my sheep pen will never open, I want to accept the “perfect peace” given to me by the shepherd. The lesson I’m seeing here is that I sometimes resist what I’ve already been given. I can be like a little sheep in a beautiful meadow, with plenty of room to graze and romp, but I’m pressed up against the wall and bleating for what’s on the other side. My mind can only be steadfast when I trust. Isaiah 26:3-4 contains great reminders to trust in God because he is the giver of these good things like peace, protection, and guidance, so I’m excited to get it memorized. The last connection (for now anyway) is between Isaiah 26:4 and the books of Daniel and Revelation. The image of a rock is often used to describe God. This image represents strength, protection, safety, and something that exists naturally. We cannot create a rock– it is just there. Many times in Scripture people (like Moses and David) were protected by rocks or caves, and in the story of the Exodus alone there are many different mentions of rocks: they were used for protection (Moses is placed in a cave as God passes by), for provision (water gushes out of the rock), for remembrance of God (altars are set up to remind the people what God did for them). In the book of Daniel, chapter 2, Daniel interprets King Nebuchadnezzar’s dream of a statue made up of mixed metals and other natural materials. In Daniel 2:34-35 Daniel tells the king about his dream. He saw that “a stone was cut out by no human hand, and it struck the image on its feet of iron and clay, and broke them in pieces. 35 Then the iron, the clay, the bronze, the silver, and the gold, all together were broken in pieces, and became like the chaff of the summer threshing floors; and the wind carried them away, so that not a trace of them could be found. But the stone that struck the image became a great mountain and filled the whole earth.” This points not only to events that would happen after King Nebuchadnezzar’s reign as the Medes, Persians, Greeks and Romans rose and fell in power, but points to God’s eternal kingdom described in Revelation. Maybe it’s a stretch, but when I read “rock” I thought of what I had read just over a week ago about the rock from the king’s dream. To sum it all up: I can be held in perfect peace, with a steadfast mind, if I will trust God. I can trust God because he is the Rock eternal, plus all of the other things I know about him from his Word, which his Spirit graciously weaves together in my mind at the right times. This is because of his love for me. Thank you, God! 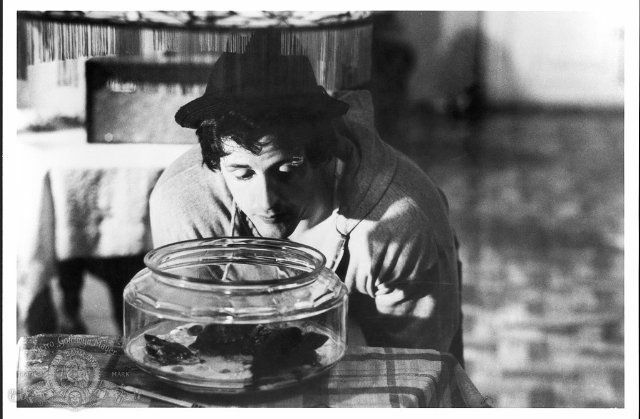 It’s Rocky… with his turtles! What connections does the Spirit bring about for you when you read these passages?